A delegation of the Petrochemical Engineering Department paid a visit to Sidi Kerir Petrochemicals Company (SIDPEC) on Monday 30/7/2018. The delegation was comprised of Prof. Mohamed Fahim, the Head of the Petrochemical Engineering Department, Associate Prof. Riham Hazaa, Associate Prof. Noha Saeed, Associate Prof. Rania Farouk. 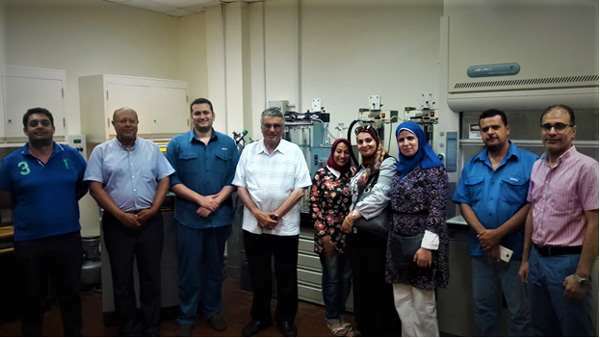 The PUA delegation were escorted in a tour to be conversant with the company’s laboratories and its equipment. The delegation was then assembled with Eng. Mohamed Selim and Eng. Mahmoud Saad in order to seek means of cooperation between SIDPEC and the faculty of Engineering at Pharos University in regard with graduation projects and scientific research.